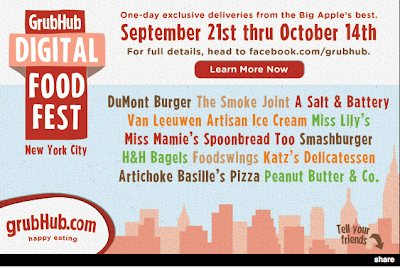 Brace yourself, because today marks the launch for GrubHub's Digital Food Festival! Translation: free Restaurant Week. All fall GrubHub has the hookup to a number of essential New York restaurants; places you simply have to try, places with lineups down the block, and places that don’t normally deliver. On a number of days throughout the season, GrubHub will feature a New York restaurant that will offer a certain number of diners an exclusive entrée. The restaurant designs the dish, GrubHub receives the order, the restaurant makes the dish, and GrubHub delivers it to the diner. Today enjoy free ice cream from their first restaurant partner, Van Leeuwen Ice Cream. Just use GrubHub.com to order a free scoop of ice cream and pick it up between 12pm and 10pm from either their store (E. Village) or the truck (Little W. 12th and Washington). Keep up on all the action online!